In March 1973, Pink Floyd’s Dark Side Of The Moon album was released to mixed reviews. The new and eighth studio album by the English rock band was deliberately gloomy, a thematically linked homage to insanity, stress, schizophrenia and the paranoia everyone experiences in their daily struggles with life. Dark Side Of The Moon: A Piece For Assorted Lunatics, as it was known then, was performed live in front of an assembled press in February, 1972, more than 12 months before it was officially released. The music was recorded at London’s Abbey Road Studios in several sessions spanning eight months. With its intellectual sound and heavy melodious thinking on the human condition, it was certainly no Sgt. Pepper’s Lonely Hearts Club Band or Electric Ladyland. Even the band’s members struggled to put a finger on why the album was so especially popular. Since its release it has sold more than 45 million copies worldwide. It spent an astounding 937 weeks on the Billboard 200. In addition to this success, Dark Side Of The Moon transformed Pink Floyd into the big league of creative forces and remains the concept album against which all others will be measured. Pink Floyd managed to incorporate what they had learned from their experimentations into pop structures, with relatively short catchy songs that retained imaginative sonic ideas such as the chiming clocks in the track ‘Time’ and the clinking of coins in ‘Money’. As the sole lyricist for the album, Roger Waters wrote words reflecting on modern life, and with other titles like ‘Brian Damage’, and ‘Us And Them’, they permeated gloomy pessimism. He once said he wanted the lyrics on the album to be “more lucid and direct than anything the band had written before”. Dark Side Of The Moon was the first Pink Floyd album to break into the United States’ Top 40 chart. It was hugely popular. ‘Money’ was regularly played on the airwaves, which helped the album’s rise through the Billboard 200 chart. Within two months of its release, it was sitting pretty at the top. When the album was re-released in 1993 to mark its 20th anniversary, Dark Side Of The Moon found its way back into the charts and not only is it the band’s most successful album, but it is one of the best-selling albums worldwide. Formed in London in 1965, Pink Floyd was made up of singer/guitarist Syd Barrett, bassist Roger Waters, keyboardist Richard Wright and drummer Nick Mason. Given the success of Dark Side of the Moon, it’s hard to recall that the band’s first seven albums had had moderate success. By the end of 1967, Barrett’s increasingly erratic behaviour had become a liability and he left in March 1968, replaced by David Gilmour. 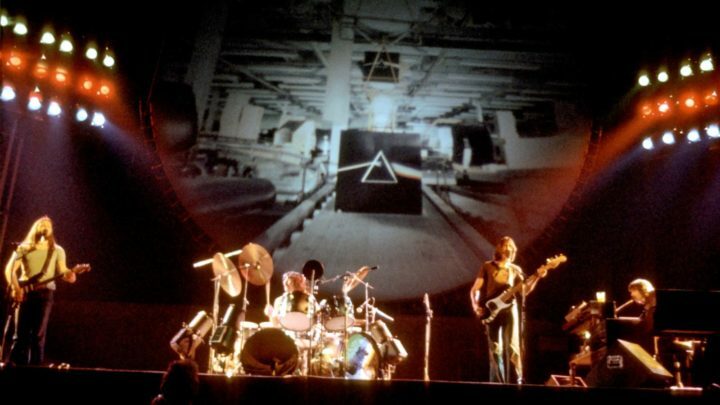 After Dark Side of the Moon, Pink Floyd were so successful they were playing stadiums and putting on elaborate shows that included films and giant props. In 1977, Roger Waters (co-lead singer and main songwriter) was so disillusioned with their impersonal approach to their music he turned his feelings into a song cycle called ‘The Wall’, the title representing the barrier between a rock star and the audience. It was the first major artistic comment by a rock artist on his relationship with the audience. The double LP titled The Wall was issued in November, 1979, (their 11th studio album) and quickly became their second most successful album, spending 15 weeks on the top of the US album charts. It also spawned a worldwide number one single ‘Another Brick In The Wall’ and a movie starring Bob Geldof. In 1990, Roger Waters staged an all-star production of The Wall — Live In Berlin on the site of the Berlin Wall. It was staged for charity. Roger Waters left Pink Floyd to establish his solo career in the mid-1980s. Without him, it was left to Gilmour, Wright and Mason to continue as Pink Floyd and together they released The Division Bell in 1995. Although it topped the charts on both sides of the Atlantic, the originality of the band had disappeared. Are you a Pink Floyd fan? Do you remember when Dark Side of the Moon was released?